The Vario-Pergola is an innovative, modern addition to the Helioscreen range, and it is ideal for most outdoor living areas, including courtyards and decks. This product is self-supported by 60x60mm square front posts and does not require a substructure, meaning it can be easily attached using simple wall or ceiling brackets. Based on the ever-popular Varioscreen system, the Vario-Pergola is lightweight yet extremely robust and comes with built-in gutters – allowing the awning to be used in wet conditions. 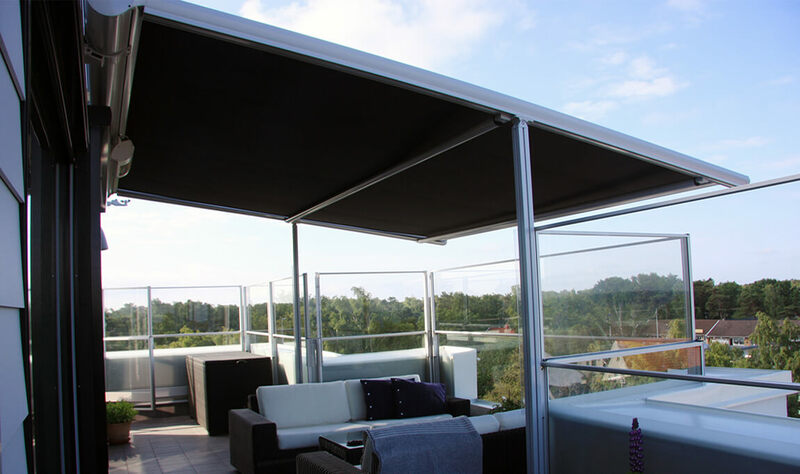 This custom pergola sunroof can be manufactured using a variety of different fabric types to suit your specific requirements, including Helio 93, Helio 86 and Helioshade 100. If you are searching for a high quality, affordable pergola sunroof for sale, the Vario-Pergola is one of the best external sun control solutions on the market. While our customers cannot buy our pergola sunroofs online at this stage, our friendly staff are able to visit your home or business premises in order to carry out a personalised measure and quote. Contact us today on 1300 853 518 to book a visit. Collect the PDF Brochure for Click Here.